Blackboard signs, & Gift ideas! 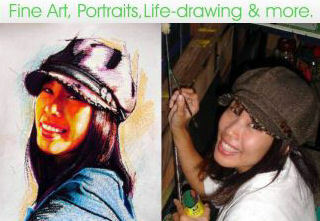 Your first choice in professional Gold Coast Chalk Art. Professional Chalk Art allows you to create a unique hand drawn look for many types of signage. 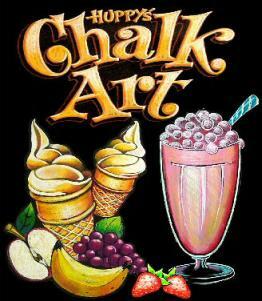 Smudge-proof Chalk Art is great for Restaurants, Cafes, Food Courts, Menus & Point of Sale Material. Huppy’s Chalk Art specialise in the design and creation of custom designed smudge-proof signs, using our brightly coloured chalk on blackboards. Since developing the original process in 1979 Chalk Art by Huppy has sold well over 3000 Chalk Menu boards to happy customers all over the world. Our eye-catching chalk art boards are especially treated to last the test on time as well as demanding the attention of all that view them. Our Chalk Art is guaranteed for years. Our Chalk Art boards allow you to change your “daily specials” and prices without any effect on our permanent chalk art. Convienience, customisation, flexibility, awesome are four words best used to describe our Chalk Art. Don’t get landed with inferior Chalk Art signage, we are here for all you chalk art needs and we offer the best chalk art at the best price. Enter our web site to learn more about our boards, view our Menu Gallery containing samples of our work and read our clients’ Testimonials.